The all-new Chevy Volt is perfect if you want a single car that shows off your green street cred AND doesn't leave you scrambling for an outlet on a weekend road trip. Even if all you want is an affordable, good-looking, nice-driving, exceptionally fuel-efficient car, it's worth a look. If those weekend journeys involve more than two people for an extended period of time, the new Volt's rear seat isn't going to cut it. The 2016 Chevrolet Volt is all-new this year. There's strikingly good styling inside and out, increased electric-only range, better fuel economy from a new range-extending engine that now uses regular gasoline, a small center position in the rear for 5-passenger capacity, and excellent Apple CarPlay iPhone integration. The new Chevy Volt's interior looks and works great, ditching capacitive touch buttons and shiny plastic in favor of a conventional design. The multifunction steering wheel is also your gateway to the multi-info display, which shows speed, battery use and myriad other functions. We like the new touch screen, and there's good head- and legroom for the two front passengers. The rear seat is still tight for tall passengers, and that goes double for the new fifth seating position. It's for short trips only, as nobody could tolerate straddling the T-shaped battery hump for more than a few minutes. Chevrolet designed an alternative-fuel vehicle that looks so good that we'll bet some people will buy a Volt just because they fell in love with its appearance, and not because they needed an EV. The sleek lines borrow some elements from the previous Volt, like the grille inserts, for example, and the lightning bolt through the "V" in Volt on the badge. However, the new Volt doesn't look like some sort of a sci-fi movie prop. The proportions are right-on, the headlights and taillights are distinctive without being weird, and the profile is modern and spot-on. The improvements in the 2016 Chevy Volt's driving dynamics are apparent from the moment you pull away from a stop. The new Chevy Volt is quicker, giving drivers a satisfying shove in the back when they mash the accelerator. But it goes beyond just managing the prodigious torque an electric motor creates. Bend the Volt into a curve, and its flat stance and firm suspension combine with accurate steering to make it.fun. Yes, a fun EV. Brakes are satisfying, partly because of their strength, but also because of the lack of weirdness between mechanical and regenerative braking. On the latter, the new Volt features a Regen On Demand paddle on the left side of the steering wheel. Hold it down and the electric motor's regenerative braking is enhanced, slowing the car dramatically. Get good at it, and you'll find yourself hardly ever using the actual brake pedal. A base 2016 Volt LT will carry a Manufacturer's Suggested Retail Price (MSRP) under $34,000, including the $825 destination charge. That's before the $7,500 federal tax credit and any state and local credits you may qualify for. A new Chevy Volt Premiere starts around $38,400, and includes leather seats and a lot of other equipment. The base Nissan Leaf undercuts the Volt by a few thousand, but can't go much beyond 80 miles without needing a full recharge. On the other hand, a Ford C-Max Energi starts only a couple thousand less, but doesn't offer the 50-plus-mile EV range of the Volt. Historically, electric vehicles don't do well when it comes to resale value, and the Volt splits the difference between the Ford C-Max Energi and Toyota Prius Plug-In. Be sure to check the KBB.com Fair Purchase Price to see what others in your area paid for their new Volt. 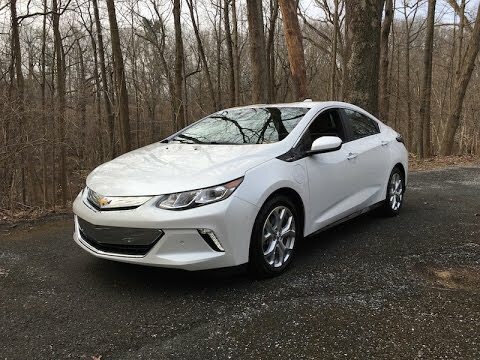 For 2016 the Chevrolet Volt LT comes standard with luxury-grade features like push-button start, automatic climate control, remote start, keyless entry, and 4G LTE OnStar with a built-in Wi-Fi hotspot. It also comes standard with an 8-inch LCD touch-screen infotainment system that includes Apple CarPlay. There's a rearview camera, cruise control, tilt-and-telescope steering wheel with multiple controls for the various audio and infotainment systems. Standard safety equipment includes multiple airbags, including a knee airbag to prevent sliding under the steering wheel in a collision. While it's common for automakers to put all options into packages, the Volt still allows individual options. For example, you can get leather seats in your LT, as long as you include the Comfort Package that adds heated seats and steering wheel. You can also upgrade from the base audio system to the Bose system. However, it might just be easier to pick the Chevy Volt Premier, which throws in all those options. It also makes driver-safety systems, such as blind-spot, forward-collision and lane-keep assist available. The 2016 Volt's EV-only range is more like a minimum than a theoretical max. We managed 50 miles of EV range while cooking it on a famously twisty road north of San Francisco. We could've gotten more had we taken it easier, and used Regen On Demand more religiously. Ever look at your iPhone and wonder why your car's infotainment system couldn't be as clever and intuitive? Thanks to Apple CarPlay it is. Just plug in your phone, tap the CarPlay icon on the screen, and you have access to Siri, texts, maps, iTunes music and more. The 2016 Volt has a gasoline engine, displacing 1.5 liters and putting out 101 horsepower. However, it's a generator, there to supply electricity to the drivetrain when the 18.4 kWh battery runs out after about 50 miles. Moving the Volt falls to a pair of electric motors with an output of 149 horsepower. A 50-mile range may not sound like much, but Chevrolet notes that about 90 percent of car trips fall within that range, and that unlike a pure electric vehicle, you have the capability of driving up to 420 miles before refueling the Volt; good news, it now takes regular unleaded. A full recharge takes about 4.5 hours on a 240-volt charger or roughly 13 hours on a standard 120-volt plug. The next-generation 2016 Chevrolet Volt improves significantly on its predecessor, with a better all-electric range - an easily attainable 53 miles - and up to 420 miles of total range thanks to a more fuel-efficient engine. But it's not just more efficient. It's better to drive, with a nicely sorted suspension, good steering and decent power from its unique drivetrain. The interior replaces gimmicky capacitive-touch surfaces with actual buttons and Apple's excellent CarPlay iPhone integration. It can seat five people - for a short period of time at least - and it looks great. With a starting price of about $34,000 before federal and state EV credits, the Volt is going to give Prius and other EV buyers pause.